Regular rotation of your vehicle's tires is essential to maintaining even tread wear for optimal performance and safety throughout the life of the tires. A standard tire rotation involves moving the rear wheels to the front on the same side, and from the front to the back on opposite sides. Different patterns are recommended for unidirectional, asymmetric, snow or full-size spare tires, or on vehicles with different size tires on the front and rear axles; this information will be in your car's operating manual. It's always best to rely on experts like those at Ian's Tires. A temporary spare is not included in tire rotations, although its air pressure (which is typically much higher than your normal tires) should be checked at that time. Your rotated tires will also require an inflation adjustment in their new positions. 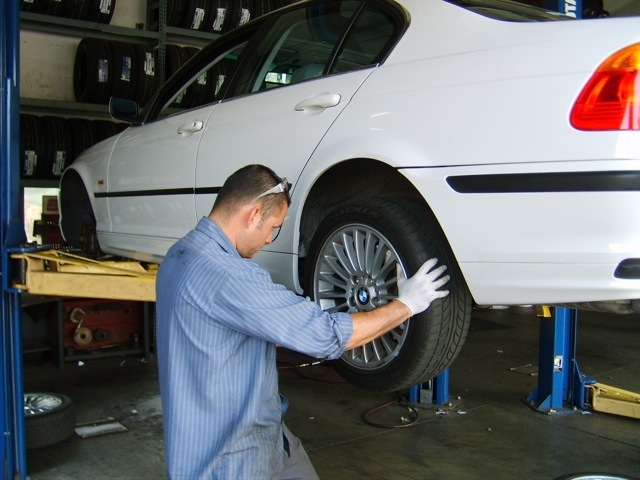 Frequency of tire rotation is generally recommended every 5,000 to 7,500 miles by your automobile's manufacturer, except in rare cases where no rotation may be recommended (e.g., for the BMW Mini). However, by doing a rotation every 5,000 miles, which Ian's Tires and Auto Repair recommends, your tires' performance will be enhanced and they will last longer, too. With tire purchase, we will provide regular 5,000-mile tire rotations for the life of the tires—ask us for details. Primarily, uneven wear is a result of differing weight on the front and rear axles, which is by design, especially in front-engine cars, where the front axle bears more of the weight. Because of this, in addition to the toll caused by braking, it is not unusual for front tires to wear out nearly twice as often as rear tires, requiring more frequent tire rotation for front-wheel drive vehicles. Turning your car during normal operation causes the outside front tire to wear down sooner. In the U.S., where we drive on the right side of the road in left hand vehicles, that tends to be the left front tire for numerous reasons. Asymmetric sidewall wear, usually on the right tires, from curb bumps while parking. Mechanical problems can lead to uneven tire wear if the wheels are not aligned with each other and the vehicle. An under- or over-inflated tire will wear differently than your other tires. A hard impact, like a fender-bender or severe pothole can cause misalignment, which results in uneven tire wear. That is why, even if everything seems all right to you, it is important to bring your car into Ian's for a checkup and possible tire rotation service after any such incident.